So much for all my healthy fresh salads this month. Holiday baking, so chocolate is the preferred (necessary) treat of choice. This recipe actually popped up on my Facebook page, and knowing that we are a family of Chocolate Mint fans, I thought I would give it a go. Verdict: A little bit faffy to make with the different layers, but very delicious. My kids both thought it tasted like the Chocolate Mint biscuits we buy as a treat. Baking for back to school morning teas, was in order. Using my Homemade Happiness book again, I made Delicious Date Loaf. It made quite a lot of batter, so I used two smaller loaf tins for this recipe. Verdict: Lightly spiced, moist inside and a lovely chewy crust, this was delicious still warm with slightly melted butter. Having seen numerous recipes in various books and internet sites for Freekah salads, I finally found some in my supermarket. Not having things like pomegranates on hand I ended up googling ways to use it and found this salad. I added some raisins and walnuts to it, and omitted the celery because I didn't have any. Verdict: Nice with a hint of smokiness from the way freekah is roasted after harvesting. I don't feel the urge to stock up on freekah, and could probably easily substitute quinoa, brown rice or burghal in this. Week Four: My new Chelsea Winter cookbook , Scrumptious is very inspiring. Lots of delicious recipes, so far I have made three of them. Caramel Apple Cake, Snickalicious Slice and Sausage Pumpkin Pasta Bake. Verdict: Mr J reckons this cake was made to be a dessert, preferably with ice cream, though he was happy to eat it any time. The Snickalicious slice has been a big hit, not overly sweet, but rather rich and definitely not everyday baking I am also thinking this is best hidden away from my family and kept as a 'me treat'. The Sausage Pumpkin Pasta Bake was delicious too, another big hit with the family, it made enough for two nights. Of course all will be made again. my sister reminded me the other day that we needed to swap Christmas decorations again this year. We are working on the 12 days of Christmas series from mmmcrafts. I do the odd numbers - she does the even, ideally we make two - one for each of us. This is No. 5, a golden ring, which I started back in February, so good to finally have it finished. I just need to make my one now. I thought I should probably do something with the Liberty hexis I sewed up earlier this year, so have started sewing them together - still not sure what I will make with them though. still working on the Liberty Bloomsbury - I wasn't happy with a lot of the long rows I had done, so unpicked them and started again. I am much happier with them now. my new Chelsea Winter cookbook - Scrumptious, (I have baked some lovely treats from this already, but will put them in my Cook The Books post at the end of the month). The Secret Recipe for Secret Chances by JD Burrett, set in Sydney, a novel of frinds, family, food (with recipes) and second chances. I have been working on getting the vegetable garden planted for summer, so far african marigolds, lettuce, beetroot, a cherry and heirloom green tomato, cucumber, capsicum and courgette plants have gone in. Also flowers for picking, cosmos and snapdragons this year, maybe zinnias if I can find room for them. So pleased to see my Dietes have started flowering too. Feeling like a break from surburban living and it's associated stresses, The Scout, Miss B, Mr J and I headed out to Port Waikato, for a walk on the beach. Sistuated on the west coast it is a black sand beach and today was particularly wild and windy. Lots of salt spray, rain showers, and sand blowing around meant all cobwebs were definitely blown away, and we ended up windswept and invigorated. A Hexi Quilt, Do I Dare? 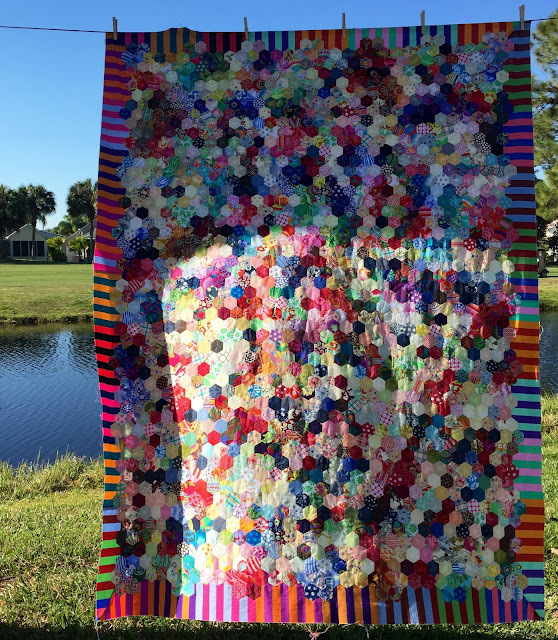 After the success of my AMH hexi pillow, and then seeing these fabulous hexi quilts by Maryse and Jodi, I have an inclination to start a long slow hand made project. (Not that I have finished all my other projects). I am thinking a hexi quilt could be it. Do I stick to one designer/design house, so there is sort of a cohesive scrappiness to it, or do I go totally scrappy? 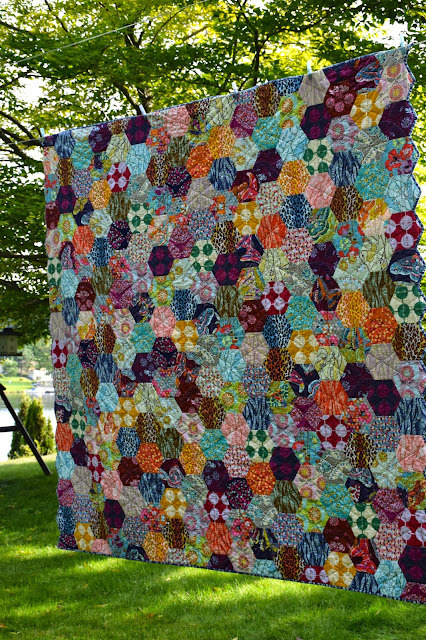 Part of me would love to use all my Anna Maria Horner fabrics for this, as I did in my pillow, and as Maryse has done in her Honeycomb Quilt, there is something almost bohemian about the richness and clashiness (is that a word) of all that colour and pattern together in a single quilt. The other part of me says it is sacrilege to cut up all those beautiful prints into tiny squares, and I did have plans for an AMH Irish Chain Quilt. The scrappy option is realistically feasible too. Each year my sister and I swap 100, 2.5" squares of fabric from various projects we have worked on throughout the year, so I have a good collection of precut scraps ready to start using. I am anticipating I would need at a minimum 1000, 1" hexis for a relatively good sized quilt. Maryse said hers took eight years to complete, hopefully mine wouldn't take that long. I figure if I work in blocks of 100 it makes it a little bit easier to feel as though I am making progress. What do you think - am I mad? I am trying to talk my sister into doing one at the same time. Any one else want to join me - perhaps this could be a project we start on New Years Day 2017. Some of the beautiful flowers seen at the Auckland Botanic Gardens during the school holidays. Sometimes, we start things because everyone else is, we want to feel that we belong to that group, and to experience the camaraderie that goes with that belonging. My #100days100blocks project was like that. After a wee bit of deliberation, I have decided to stop my participation at 48 blocks. I am not enjoying the project, and I know it is meant to be a no stress thing, but I feel stressed and under pressure if I am not up to date or even a couple of days ahead, which I know is silly. To me quilting is meant to be a fun, relaxing hobby and it shouldn't make me feel like this. So rather than continue to invest time in a project that is not really making me happy, I am going to turn these 48 blocks into a quilt and donate it to my local Hospice. I can't think of a better place for it to go, and of course that means I can start a new project or two that makes me happy. I'm a little bit late to the Alison Glass fan club, but after seeing so many of her fabrics used in the Jeweled Kaleidoscope quilts and cushions being made by the pattern testers, I finally succumbed and bought some of her beautiful endpaper design from her Ex Libris collection. Another block for the Seaglass sampler quilt - this paper pieced heart from Lilyella is the 10" poetry version of her Love Story Block. School holidays again, this means another train trip into the city. Today we explored Wynyard Quarter, an area of of the waterfront which used to be known as Tank Farm because of all the oil and petrol tanks/silos on it. It is now home to many cafes/ seating areas, and interactive play areas. Miss B and Mr J weren't to old to enjoy the slide that had been made in a re-purposed silo. There is a lot of new building taking place in the area too. We were also lucky enough to see the Te Wero bridge operating as a barge went through underneath it, and the summer cruise season kicking off with the Celebrity Solstice in port. Linking up to Wandering Camera at Whims and Fancies.